Now that Nathan has been excavated, the non-superhero non-team of Misfits get back to the important business of going clubbing and having accidents with their powers. Oh, and more of the mysterious masked man we’re apparently calling “Super Hoodie”. So did it hit the magical Misfits sweet spot of disturbing, funny and weirdly touching? Did Nathan call Simon “Barry” again? I hope so. O Brother, Why Art Thou So Thick? The main thrust of this episode is actually the appearance of Nathan’s long-lost half brother Jamie, played by Sam Keeley, who provides a bit of companionship for the poor lamb. He proves to be more a man of action than poor Nathan, both in his success with women and his amusing reaction to their father (Dexter Fletcher). Personally, after being carefully trained by past episodes, I spent the whole time waiting for the newcomer to unveil his superpower. This could be my own fault, considering there been no hints that there was anything to see. Still, it did mean I was shocked when the ending came. The subsequent twist was also quite clever, and I had no idea it was coming. Considering even Scrubs have used it before, that’s impressive. Points from a comic book perspective, as well, for a creative use of Nathan’s power. Robert Sheehan is great, as usual, managing to both pull off Nathan’s obnoxiousness and make the emotional scenes work. I believe I speculated in the comment section last week that “Super Hoodie” might be Curtis, time-travelling. We saw clearly this week that he is white, so that theory is knocked on the head. This week’s small Curtis storyline was quite fun, though; I do enjoy the time travel stuff, even if I have no clue how it might work. Watching everyone’s power go into reverse was cool, although Simon does get Stupid Idea Of The Week for trying to covertly follow someone whilst his backfiring power was making him super-visible to all. One thing I sometimes notice about Misfits is that the characters who aren’t in the spotlight often get very little to do. Curtis and Alisha, in particular, are largely sidelined this week. But it seems to work, so fair enough. 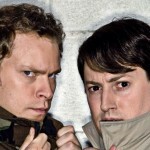 Another good episode, no sign of a lapse in form for Misfits. Catch the episode on 4OD, it’s well worth it.